Before the related quest, he does not exist in the game, but once Vicente Valtieri hands over the contract, he will show up in the captain's cabin of the Marie Elena, living the life of a true pirate captain. 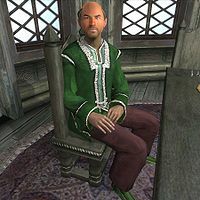 Every day between 6am and 2pm, he can be found seated at the dinner table doing absolutely nothing but relaxing and taking confidence in the fact that First Mate Malvulis and the other pirates are guarding the ship. When he finally gets out of the chair, he will pace restlessly around the cabin until his dinner time at 8pm. He takes his time and eats until midnight, when he heads to bed and sleeps securely for six hours. Gaston has an unused greeting which can never be heard due to his forcegreet dialogue always taking precedence: "You ain't one of me crew. What business ye be havin' here, mate?"